NOFA CONFERENCE: Co-ops Are Everywhere in the Food System! CO-OP MONTH: Get Ready to Celebrate! UPCOMING EVENTS: Maine’s Common Ground Country Fair, New England Farmers Union Convention & More! 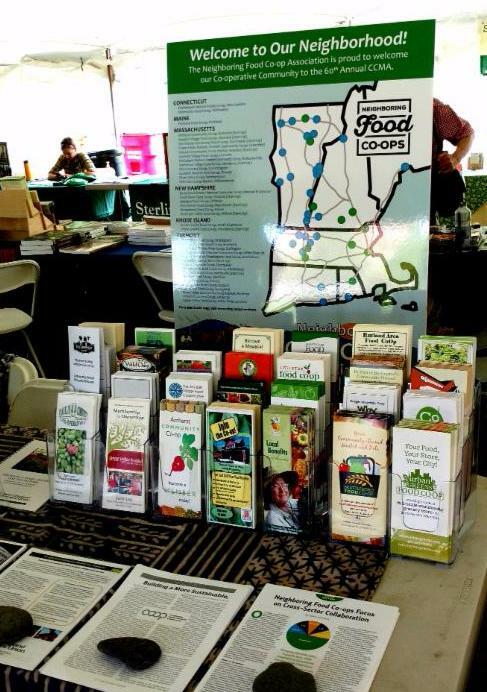 The Neighboring Food Co-op Association (NFCA) is a proud sponsor of the Northeast Organic Farming Association (NOFA), working together to promote a more just and sustainable food system in the Northeast. As part of our collaboration, the NFCA works with partners to organize a special series of workshops on co-operatives and their contribution to regional food systems and economies at the annual NOFA Summer Conference. Didn’t get to the conference this year? Get Ready to Celebrate Co-op Month! This October, the Neighboring Food Co-op Association (NFCA) is joining over 30,000 co-ops and credit unions across the United States in celebrating Co-op Month, recognizing the many ways co-operatives help to build stronger communities and more resilient local economies. For 2016, the National Cooperative Business Association CLUSA International has identified “Co-operatives Build” as the theme, spotlighting the advantages co-ops offer to their members and the communities in which they live and work. For ideas and resources to help your food co-op join the celebration, see below. 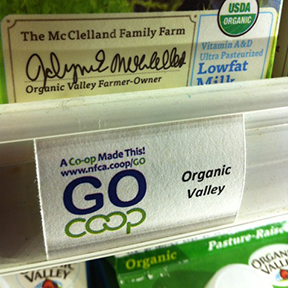 Learning more about some of the co-operatives in our food system is easy: Just look for the “Go Co-op” signs (at right) on the shelves of your Neighboring Food Co-ops. You may be surprised to find so many items made by co-operatives in New England, including dairy products from Cabot, McCadam and Organic Valley, fresh produce from Deep Root Organic Co-op, fairly traded coffee, tea and chocolate from Equal Exchange, beverages from Katalyst Kombucha and Green River Ambrosia, seeds and bulbs from FEDCO, naturally fermented vegetables fromReal Pickles, northeast grown frozen fruits and vegetables from theNeighboring Food Co-op Association – and many others. For more examples of how food co-ops empower people to build community, please visit: www.nfca.coop/about. For ideas and resources for your food co-op’s Co-op Month celebration, visit: www.nfca.coop/Co-opMonth. The National Cooperative Business Association, CLUSA International (NCBA CLUSA) is proud to announce the launch of the Emerging Co-op Leaders Scholarship Fund to continue the legacy of our beloved friend and colleague Thomas Bowen, who passed away Friday, August 19, 2016. As an alumni of the Filene i3 innovation program and a supporter of the Association of Cooperative Educators (ACE) and Cooperation Works!, Thomas was deeply committed to mentoring next-generation co-op leaders. Growing up in upstate New York surrounded by agricultural co-ops and raised by parents who insisted that he join the local credit union, Thomas often said he was destined to work within the Co-operative Movement. His credit union career began at Envision Credit Union in Tallahassee, Florida. He held numerous roles within the credit union sector-from teller to vice president of Communication. Before joining NCBA CLUSA as Director of Member Relations, Thomas worked for a marketing firm whose sole clients were credit unions. Thomas also enjoyed working with the food co-op community, attending CCMA 2015 in Boise, ID, and assisting in the early planning for 2016 conference at the University of Massachusetts, Amherst. Thomas was also a participant in the Up & Coming, Up & Running 2016 conference for food co-op start-ups. In lieu of flowers, Thomas’ family has asked that donations be made to the scholarship fund, which will benefit up-and-coming co-operators by disbursing scholarships to NCBA CLUSA’s 2017 National Cooperatives Conference and other educational events. Click here to contribute. Have you noticed the “Cave to Co-op” signs in the cheese section of your local food co-op? The project is a partnership between Provisions Internationaland the Neighboring Food Co-op Association (NFCA) to support artisanal cheese producers in our region and make their products more easily available to co-op shoppers. Each month, a delicious local cheese is featured at a great price. 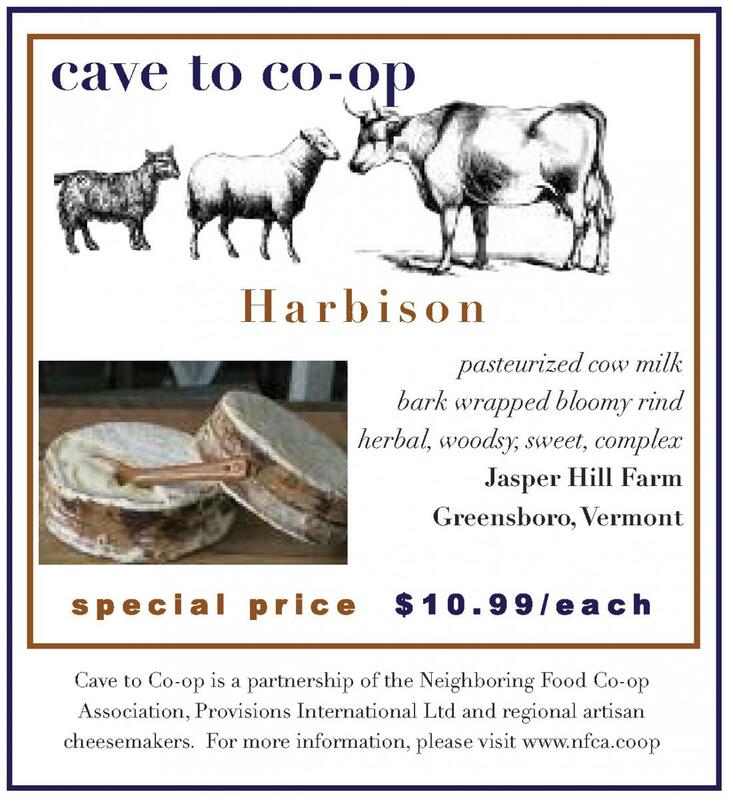 August’s “Cave to Co-op” special artisan cheese is “Harbison” from Jasper Hill Farm, Greensboro, Vermont. Harbison is a bark-wrapped bloomy-rind cheese with woodsy, sweet, herbal, and bright flavors. The bark, cut from Jasper Hill Farm’s woodlands, holds the delicate cheese together, provides flavor to the creamy paste, and allows for an ideal presentation as the centerpiece of a cheese plate. The cheese is named after Anne Harbison, seen by many to be the grandmother of Greensboro, VT.
For more information on the program, visit: www.nfca.coop/CaveToCo-op. Central to the mission of the Neighboring Food Co-op Association (NFCA) is using the combined purchasing power of our member co-ops to support shared success and contribute to a more sustainable and resilient regional food system. For example, our “Cave to Co-op” program is a partnership with the distributor Provisions International, and New England’s artisan cheesemakers.The goal of the project is to contribute to a stronger regional food system by introducing local cheesemakers to consumers and encouraging them to try their products. Each month, a new cheese is featured by participating member food co-ops, accompanied by a newsletter article and other promotional materials on the producer. Through the joint effort of these cheesemakers, Provisions International, and the member food co-ops of the NFCA, this program has moved 14 tons of regionally produced cheeses at an affordable price. For the past few years, we have also been working to develop our “Farm to Freezer” project, the NFCA’s own line of Northeast grown and packaged frozen fruits and vegetables. Last October we took a major step in making the program more sustainable over time by forming a partnership with regional distributor Associated Buyers to make these products available to all of our member co-ops. Since establishing this relationship, we have sold nearly 9,000 pounds of frozen produce, sourced, packaged, and sold right here in the Northeast. While we are excited about our progress, we also recognize that – given the obstacles to regional sourcing – this will be a long-term effort. We want to thank our member co-ops and their shoppers for their support in making this program a success. As we enjoy the bounty of the harvest season, we have begun work with our farmer and processor partners to ensure that delicious regional produce will also be available to our co-op shoppers this winter and all year ’round! We invite you to seek out our frozen, Northeast grown Blueberries, Organic Broccoli, Organic Edamame, Organic Green Beans, and non-GMO Sweet Corn in the freezer section at your local Neighboring Food Co-op member co-op. They’re easy to find: they’re packed in the clear plastic bag so you can see what’s inside! Another aspect of our collaborative sourcing work has been seeking ways to make natural food more affordable. In response to the requests of our member co-ops, particularly our smaller food co-ops, we have also been working withAssociated Buyers to pilot affordable natural products at prices available exclusively to member co-ops. This effort is designed to support our food co-ops’ “Healthy Food Access” efforts to be more accessible and affordable, and to complement on a regional level the National Co+op Grocers “Co+op Basics” initiative, which offers a broad range of products to their member co-ops. Together, our food co-ops are working to grow our vision of a thriving Co-operative Economy, rooted in a healthy, just and sustainable regional food system. For more information on our sourcing efforts, please visithttp://nfca.coop/regionalsourcing. The Food Safety Modernization Act (FSMA) is set to have broad impacts on the farming community, and National Farmers Union (NFU) is now positioned to help ensure produce growers and processors with the information and training they need to comply with the new law. NFU recently received a $1.5 million grant from the Food and Drug Administration (FDA) to begin working with collaborators on resources and training opportunities to enhance FSMA compliance. In particular, NFU and its partners – including the New England Farmers Union (NEFU), National Young Farmers Coalition, Washington and Maryland State Departments of Agriculture, Cornell University, Deep South Food Alliance and others – will deliver outreach and training to diversified, sustainable, organic, and identity-preserved farmers and processors. Here in New England, NEFU will be working to with partners to ensure that our region’s family farms are prepared for success as new regulations take effect. Through the FDA grant, NFU will work with national, state, and local organizations across the country to provide specialized training and resources to meet the needs of local food producers and processors. “These collaborators allow our team to utilize a nationwide advocacy and educational network, while teaming with local organizations that work directly with small and mid-size food producers,” said Johnson. The Neighboring Food Co-op Association (NFCA) is an affiliate member of the New England Farmers Union (NEFU), representing our commitment to collaboration among consumers and our region’s family farmers and fishermen to influence food system policy and build a more vibrant, resilient and co-operative food system in New England. NFCA Executive Director Erbin Crowell serves as Vice President of NEFU, and many of our Neighboring Food Co-ops are organizational members. For more info on our partnership & how you can become a member: www.newenglandfarmersunion.org/co-operation. September 23, 24 & 25, 2016: MOFGA’s Common Ground Country Fair, Unity, ME. The Maine Organic Farmers and Gardeners Association (MOFGA), formed in 1971, is the oldest and largest state organic organization in the country. Each September, MOFGA organizes The Common Ground Country Fair, one of the most popular destinations in Maine each fall, with over 60,000 visitors attending. The fair will include presentations and many artisans and vendors. November 10 – 12, 2016: NESAWG’s It Takes a Region Conference, Hartford, CT.
NESAWG’s annual “It Takes a Region” Conference brings together farm and food systems practitioners across the 12-state Northeast region to learn, debate, collaborate, and innovate solutions to critical food systems issues. Each year, we look at the trajectory of the food and farm movement and the role our network can play in shaping its future. We offer in-depth working sessions that tackle important questions about our regional food system and how to strengthen it, drawing from the collective expertise and wisdom of conference attendees. This year’s conference theme is Tackling Wicked Problems in Food Systems. December 2-3, 2016: New England Farmers Union Convention, Windsor, CT.
SAVE THE DATE! Come to the 7th Annual New England Farmers Union Convention in Windsor, CT at the Hartford/Windsor Airport Marriott Hotel, December 2-3, 2016.